I have a new best friend. Her name is Instant Pot, but we call her IP. She is a workhorse! I have the DUO 7-1 which is a pressure cooker, slow cooker, rice cooker, yogurt maker, and other functions, all in one appliance. Even with all the pressure canning I do, I will admit being a little intimidated by her at first. No more…I’m in love! I’ve tried several recipes and they were all very good. However, this recipe for Moroccan Chicken is AH-MAZING! It will definitely be on the meal rotation. In a bowl, mix together the paprika, garlic powder, cumin, ginger, cinnamon and coriander. Rinse the chicken and pat dry with paper towels. Coat each chicken thigh well with the rub mixture. Press the SAUTE button on the IP and wait for it to state “Hot”. Add a little olive oil to the pot then add the chicken thighs. Brown the chicken on each side. This will need to be done in a couple of batches so you don’t steam the chicken. Turn the IP off and add the chicken stock and the browned chicken. Lock the lid onto the pot, press the MANUAL button, turn the knob to the SEALING function, and set the timer to 10 minutes. When finished cooking, turn the IP off, and let it sit for 5 minutes. Release the remaining pressure slowly, being careful not to have your hand over the vent. Remove the chicken from the pot leaving all the juices. Cover the chicken so it will remain hot. Combine the honey, syrup, and lemon juice in a small bowl. Press SAUTE on the IP. It will begin to boil. Pour in the honey/syrup mixture and whisk frequently until the sauce is reduced and thickened. I used sorghum because that’s what I had on hand. 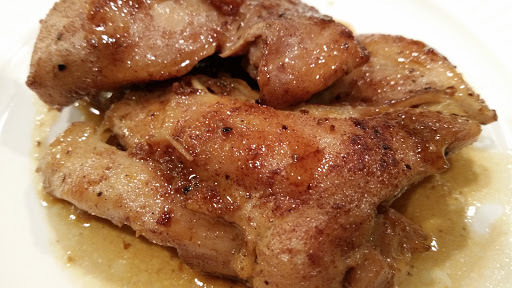 Spoon the sauce over the chicken and serve over rice….DELICIOUS! It is so tender you can cut it with a fork. Now it’s confession time. The original recipe was for half the amount of rub. I doubled it for posting here because I felt it needed more spice. I will also cook the sauce longer the next time in order to make a thicker sauce. Even without these changes, it is wonderful!